With natural gas prices down by three-quarters since 2005, cheap raw materials and energy fuel the US reindustrialisation. Market analyst IHS believes that up to € 70 billion will be invested by 2025, doubling North America’s production of basic chemicals and plastics — is America the promised land for the process industry? Much of the action is taking place on the Gulf Coast, traditional home of the US petrochemical industry. Here, manufacturers are able to take advantage of shale gas brought in by pipeline from across the country, an experienced labor force, and easy access to shipping terminals. A large number of new liquefied natural gas (LNG) plants will provide feedstocks for the chemical industry, but are also well placed to meet future export demand. Companies involved include Chevron Phillips Chemical (Sweeny, Texas); Equistar Chemicals/LyondellBasell (Corpus Christi, Texas); Sempra LNG/Mitsubishi/Mitsui Chemicals (Hackberry, Louisiana); BG Group/Energy Transfer/LNG Trunkline Export (Lake Charles, Louisiana); Sasol (Lake Charles, Louisiana); Shell/Southern Liquefaction/Kinder Morgan (Elba Island, Georgia) and Freeport LNG (Freeport, Texas). US oil is also doing well: Valero Energy said in September that it will increase capacity for light crude at several Gulf Coast refineries to handle the growing Texas oil production in the years up to 2018. The refineries in question are at Houston, Corpus Christi and Port Arthur in Texas, and Meraux in Louisiana. Valero also plans to expand hydrocrackers at Port Arthur, Meraux, and St. Charles, Louisiana. Other refinery projects in the southern states include a hydrocracker capacity increase by Marathon Petroleum at Garyville, Louisiana. The work should be complete by early 2014, a year ahead of schedule. Exxon Mobil Chemical is building a world-scale (50,000 t/y) plant for metallocene polyalphaolefin (mPAO) synthetic lubricant stocks at its Baytown complex in Texas. At Baton Rouge, Louisiana, meanwhile, the company is building a new chemicals and lubricants plant which will increase the capacity for synthetic esters and naphthalene by more than 25 %. Petroplex International has started constructing a bulk liquids terminal for oil, refined petroleum products and chemicals on the Mississippi River. Completion is scheduled for 2015. In midwestern US, where maize and soybeans rule, next-generation biofuels and fertilizer plants dominate the project landscape. As the future of biofuels based on food crops comes under scrutiny, third-generation fermentation is stepping up as a partial replacement. By mid-2014, DuPont plans to open a 1.4 million m3/y plant to make ethanol from cellulosic waste. The € 400 million plant is located in Nevada, Iowa. Fiberight LLC has plans for a much smaller (23,000 m3/y) cellulosic ethanol plant in Blairstown, Iowa. Yet low biofuels prices mean that the ride is not always smooth. A 76,000 m3/y biodiesel plant planned by Xenex Biofuels in Xenia, Ohio, fell through within the last couple of months, and the future of a 47,000 m3/y biomass pyrolysis plant proposed by Dynamotive Energy Systems at Willow Springs, Missouri, seems uncertain. In the middle of this year Valero Energy pulled out of a plan to develop the world’s first commercial wood-based cellulosic ethanol plant at Kinross, Michigan. The € 250 million project was already seriously delayed and the departure of Valero may finish it off. The region has fossil fuels too, however. The end of next year will see startup of the first oil refinery to be built in the US since 1976. Bilfinger is working to build the € 230 million refinery at Dickinson, North Dakota, for Calumet Specialty Products Partners and Montana Dakota Utility (MDU) Resources. 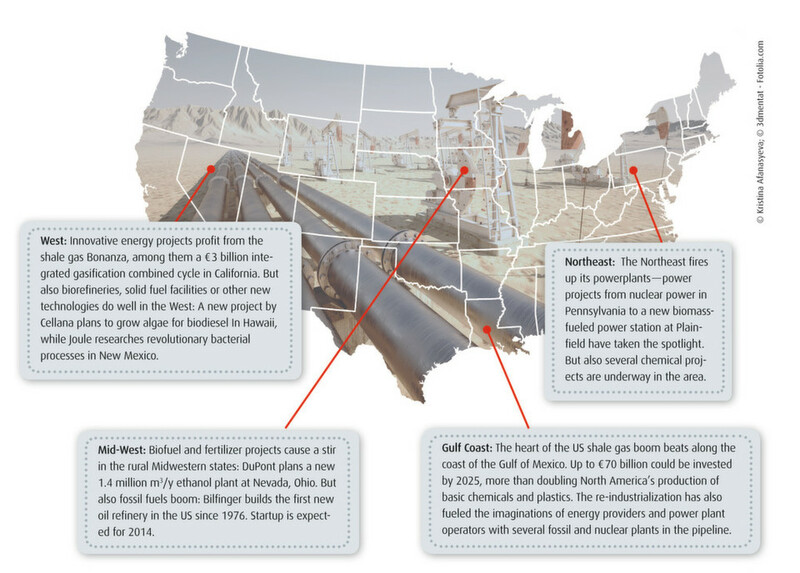 Innovative energy projects rank highly in the western states of the US: Most ambitious is a € 3 billion integrated gasification combined cycle (IGCC) power plant with carbon capture and storage (CCS) in Kern County, California. The Hydrogen Energy California plant will gasify coal and petroleum coke, yielding hydrogen that will produce 300 MW of power and one million t/y of fertilizer. Mitsubishi Heavy Industries will supply the gasifier technology and Fluor is the main contractor. Start-up is scheduled for 2017. Also based around solid fuels, and on stream this year, is Exxon Mobil Chemical’s € 1.3 billion Medicine Bow coal-to-liquids plant in Wyoming. Capacity is 2,400 m3/d of refined hydrocarbon liquids. Another synthetic liquid fuel plant, this time producing diesel from biomass, is the planned 100 m3/d facility at Rialto, Los Angeles, California. Developer Rentech says this will be the first commercial US biomass gasification facility to co-produce synthetic diesel. A demonstration biorefinery which started up last year at Boardman, Oregon, has been extended with a cellulose-to-ethanol plant. Operated by Zea Chem in partnership with Valero and Chrysler, the complex produces cellulose derivatives and C3–chemicals as well as ethanol. The € 300 million plant has a capacity of 95,000 m3/y. Joule Unlimited, meanwhile, has more ambitious plans: its 94,000 m3/y demonstration plant in Hobbs, New Mexico, will use bacteria to produce hydrocarbon fuels directly from sunlight and CO2 without the need to harvest biomass. Projects related to electric power are also prominent in the northeastern states. Scheduled for completion in 2016 is a third 1600 MW reactor at the Susquehanna nuclear power plant in Pennsylvania, operated by PPL. The project, with an estimated value of € 6.4 billion is being handled by French company Areva. The region is also making good use of its biomass resources. In Maine, for instance, projects based around forestry include a planned € 61 million plant to produce wood pellets for F E Wood & Sons of Baldwin. 70 percent of its 300,000 t/y output will be exported to Europe. In nearby Connecticut, Enova Energy Group is building a 250,000 t/y biomass-fueled power station at Plainfield. The 38 MW, € 173 million plant will start up early next year. It’s not all power projects: Evonik Industries plans to expand production of precipitated silica at its site in Chester, Pennsylvania. The 20,000 t/y plant will cost € 35 million. All the project information for this article came in the first instance from GROAB, Process Magazine’s online database of major plant construction projects (Großanlagenbauprojekte in German). As Process Worldwide went to press GROAB carried details of 2,710 projects worldwide, ranging from power plants, through refining and petrochemicals, to food and pharmaceuticals. Just over half the projects listed are already on stream, with 52 projects commissioned this year. 709 are under construction and 514 are at the planning stage. Database manager Michael Melcher explains that the editors at Process have added or updated around 140 project listings in the last three months. Project listings can be sorted, filtered and exported, with email alerts available for premium users. Integration with Google Maps allows easy visualization of project clusters and individual facilities.